We have risen from the flames! Scientifically speaking, a solstice is either of the two events of the year when the sun is at its greatest distance from the equatorial plane. The name is derived from Latin sol (sun) andsistere (stand still), because at the solstice, the Sun reaches a maximum or a minimum. The cause of the seasons is that the rotation axis of the Earth is not perpendicular to its orbital plane, but at an angle. As a consequence, for half a year the northern hemisphere tips to the Sun, with the maximum around 21 June (summer Soltice), while for the other half year the earth tips away from the sun, with the maximum around 21 December (winter solstice). Spiritually, Yule is one of the four minor Sabbats, which celebrates the rebirth of the Sun, the Sun God and honors the Horned God. Yule is the longest night of the year, when the balance is suspended and then gives way to the coming light. It is a time to look on the past year’s achievements and to celebrate with family and friends. In ancient times, the Winter Solstice corresponded with the Roman Saturnalia (Dec. 17-24), pagans fertility rites and various rites of Sun worship. This day is the official first day of winter. The Goddess gives birth to the Sun Child and hope for new light is born. The origins of most of the Christian Christmas traditions come from the Pagan Yule celebration, such as the Christmas tree, the colors red and green and gift giving. Yule is also known as the Winter Solstice, Midwinter, Alban Arthan, Finn’s Day, Festival of Sol, Yuletide, Great Day of the Cauldron, and Festival of Growth. Children were escorted from house to house with gifts of clove spiked apples and oranges which were laid in baskets of evergreen boughs and wheat stalks dusted with flour. The apples and oranges represented the sun, the boughs were symbolic of immortality, the wheat stalks portrayed the harvest, and the flour was accomplishment of triumph, light, and life. Holly, mistletoe, and ivy not only decorated the outside, but also the inside of homes. It was to extend invitation to Nature Sprites to come and join the celebration. A sprig of Holly was kept near the door all year long as a constant invitation for good fortune to pay visit to the residents. The ceremonial Yule log was the highlight of the festival. In accordance to tradition, the log must either have been harvested from the householder’s land, or given as a gift – it must never have been bought. Once dragged into the house and placed in the fireplace it was decorated in seasonal greenery, doused with cider or ale, and dusted with flour before set ablaze by a piece of last years log, (held onto for just this purpose). The log would burn throughout the night, then smolder for 12 days after before being ceremonially put out. Ash is the traditional wood of the Yule log. It is the sacred wood of the world tree from Norse Mythology also known as Yggdrasil. An herb of the Sun, Ash brings light into the hearth at the Solstice. Yule is the birth of the Sun God, who will eventually chase away winter and bring summer and life back into the planet. Although winter looks bare and cold, it is a time of hope and joy – a celebration of the warm seasons that lay ahead. The days will grow longer instead of shorter and we can look forward to warmth of the sun being brought back into our days and nights. Holly, mistletoe, evergreen, poinsettia, bay, pine, ginger, myrrh, valerian, cinnamon, nutmeg, oak, orange. Rosemary, myrrh, nutmeg, saffron, cedar, pine, wintergreen, ginger, bayberry. Stags, squirrels, wren/robin, phoenix, trolls, memecolion. 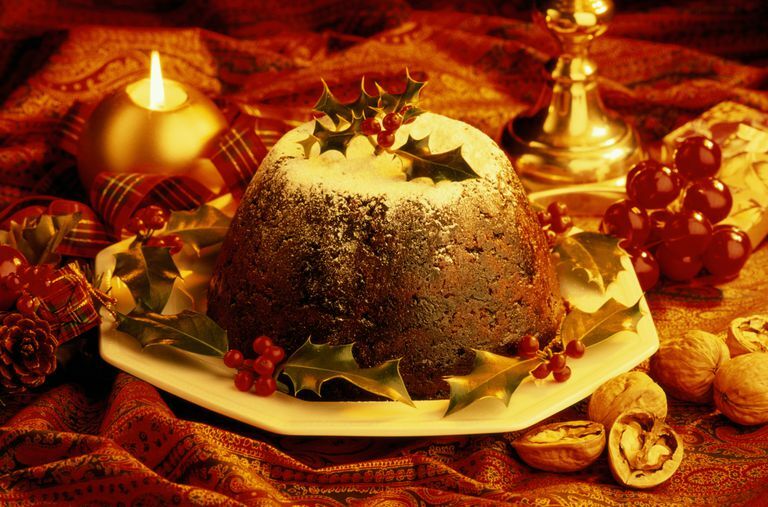 Roasted turkey, nuts, apples, caraway rolls, dried fruit, fruitcakes, gingerbread men, mulled wine, eggnog, wassail. Holiday cookie cutters can turn your gingerbread into a festive treat. Preheat your oven to 375F. Combine all the dry ingredients (except baking soda) in a large mixing bowl. Add 3 tbs of milk into a large saucepan along with the molasses (both) and butter. Melt together over low heat. Add beaten eggs and flour mixture to the melted ingredients. Dissolve baking soda in remaining 1 tbs of milk, then add to the batter. Pour batter into a greased 10-inch baking pan. Bake for approximately 45-50 minutes, or until a toothpick stuck in the middle comes out clean. 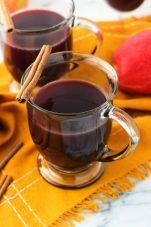 One variety of wassail, or hot mulled apple cider. Make up a batch of this before you go Yule carolling. 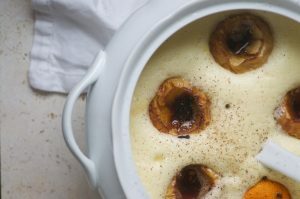 A very simple recipe that can play center-stage on your Yule table. Preheat your oven to 325F. Place the roast in a pan, then rub the meat first with olive oil and then the chopped garlic and rosemary. Pierce the pork with a knife and stick in some pieces of garlic and rosemary. Cook for approximately 35-40 minutes per pound of meat. Colors: red, green, white, gold. Decorations: mistletoe, holly, small Yule log, strings of colored lights, a candle in the shape of Kris Kringle, homemade wreath, presents wrapped in colorful paper. The Yule log has not survived into modern celebrations for the most part, and for most modern Heathens would be difficult to do without a fireplace or wood burning stove. You may therefore wish to set up a symbolic Yule log. You can carve it with wishes for the New Year, garland it, do what you wish. If you have a place you can burn it outside during Yuletide, you may wish to do so. Traditionally, the Yule log was brought in on Mothers’ Night, it was then set ablaze and hoped to burn all Twelve Nights (remember this log was nearly an entire tree to be burned in the long pits of a long house). Different areas had different customs concerning the Yule log. Everywhere the log was garlanded and decorated with ribbons prior to the procession to the longhouse. The procession was, as most procession during the holidays, a joyous one. Once burning no one could squint in the presence of the log, nor were barefooted women allowed around it. In Yorkshire, England, they practiced what is called mumping or gooding. Children would go begging and singing from house to house as the log was brought in. In other areas, the children were allowed to wassail the log the first night and drink to it. There are hundreds of pagan carols out there. I strongly suggest you search for some that your family will enjoy! Our Lady gives him birth! Our Light, our Life, our Lord!